We took the children on a bus tour of London on the way to paying my parents a wee visit this week. I highly recommend being a tourist in your own town or at least one you know very well. There’s always something to learn and new things to see regardless of how long you’ve spent somewhere. It was really exciting showing the children all the famous landmarks they’ve learned about and places where we used to work or go to when we lived there. Is there a guided tour near you, bus or otherwise? Or maybe even just a regular bus you could take that would give you a different perspective of somewhere you thought you knew well? Whilst I wasn’t the one competing yesterday (we went to cheer on my husband at a CrossFit competition) I still made sure I was eating well. I don’t meal prep every week but when I do I often wish I did it more. This is leftover taco mince, wholemeal rice, leaves, tomatoes, sour cream and lime. It was really tasty and worked well cold. Often small amounts of leftovers get thrown out but I hope this shows how those small amounts can end up making something really nutritious, saving you time and money st the same time. When I can, if I’m not focusing on solely prepping ahead I try to make a few portions more than what I need for that day so I can pack-up a few lunches and/or dinners for the following days. The lidded trays with compartments are brilliant. They can go in the dishwasher and microwave, can be stacked and fit well in the fridge too so very practical. They make for a very easy picnic option too. All you need to do is remember the cutlery! I use a couple of different recipes for banana loaf. All of them are pretty straight forward but this one is especially so. It is originally from BBC Good Food I think but it’s become a staple and obvious go-to recipe when we’ve some rather brown-looking bananas. Grease and line a loaf pan. I use the pre-cut loaf pan liners for ease. Cream together the butter and sugar then add the eggs whilst still whisking. A little of the flour can be added at this stage too to prevent (or conquer 😉) curdling. Fold in the flour and baking powder with a metal spoon. Get the children to mash the bananas in a bowl with a fork before gently folding into the batter. Pour into the lined pan and bake for 45 minutes or until the loaf is springy but firm to touch. Allow it to cool a little in the pan before cutting. It is delicious as it is but hot custard over the top would be delightful! Check out the timetable at your local library or community centre as there’s always something worth getting in the diary. Today we went along to a craft and story session at our local library. The children each made their own lighthouse and then enjoyed a lighthouse-themed story before selecting some books to take home. It’s wee events such as these that can break-up a day or offer a change of scenery. They don’t cost a thing but are lots of fun, get you and the children meeting-up with others and support the fantastic services offered in the local area. This is a really simple activity to organise and you can tailor it to wherever you like. Make one for the garden, the house, the beach or forest. Make it as long or as tricky as time and patience permit. We took our annual trip to W5 in Belfast yesterday. If you’re not familiar with it W5 is a great children’s science museum/exhibition. Whilst it’s geared towards children it is a fun day out for the whole family. As with many other museums it also has temporary exhibitions throughout the year. There is currently a great dinosaur one with extremely realistic moving models. The dark, moody setting and animal sounds made for a great experience. We all really enjoyed it and learned lots more about them all. The exhibition is on for a while longer and is included in the entrance fee so do get down there if you were considering it. We are very lucky to have Watertop Farm on our doorstep meaning that an open farm visit doesn’t have to involve a big journey. 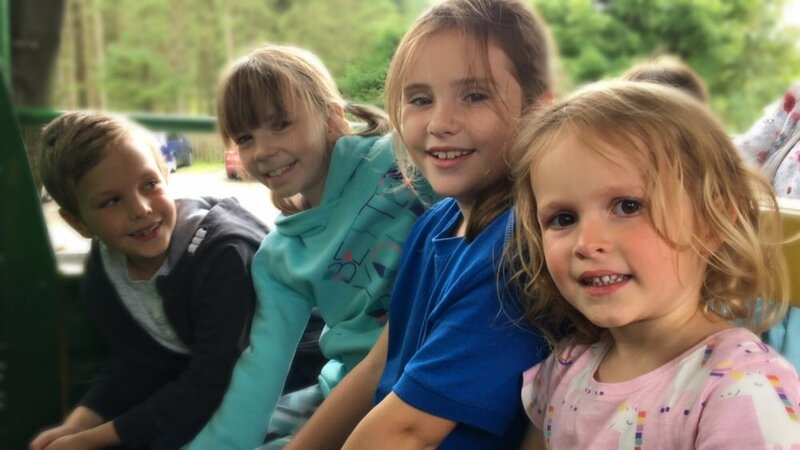 We met with friends and had a super afternoon with the animals, on the assault course, taking a guided tour round the farm, playing in the barn and relaxing in the cafe. It was a sunny afternoon and the tour allowed us to see some stunning and unique views of the surrounding countryside and seascape. A great trip for adults and children alike. What’s your closest open farm? Or is there somewhere nearby that gives you a new perspective of somewhere familiar? It was good fun with the children and a very welcome addition for when the weather is damp or cold. 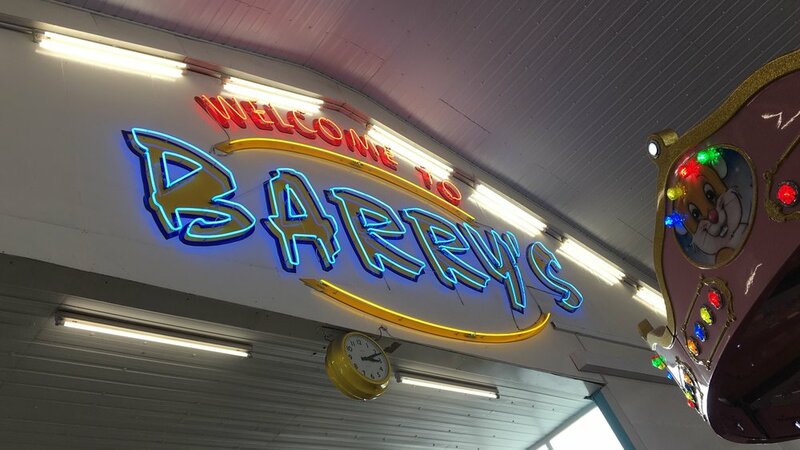 We went on to Barry’s amusements and enjoyed the rides, arcades and helter skelter as we always do. A really fun afternoon. Do you have a mini golf or crazy golf nearby? Drag the family down there and see who’s got the skills. 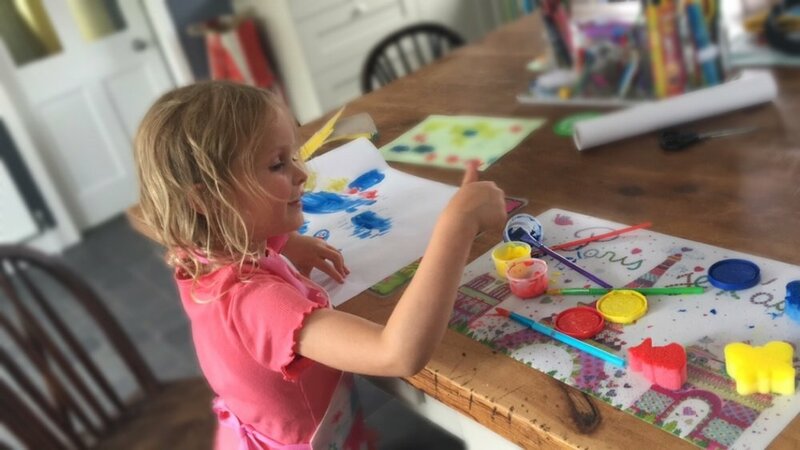 We got the paints out today along with some wee animal-shaped sponges. The children made patterns and shapes with them and tried their hands at mixing new colours and working out new combinations. Have you got any old sponges you could cut into shapes? Lots of other household items make great stamps or alternative brushes too: old pieces of material, potatoes, string, dry pasta and rubbers are just a few you might have to-hand. It’s fun to test different items to see what shapes and patterns you can create. Why not have a go one rainy day? I made this on Friday night to serve with crudités and bread at my friend’s baby shower. It’s such a simple recipe and it keeps pretty well in the fridge in an airtight container. The hummus is obviously fab for dipping but it’s a good sandwich filler and works well in a salad dressing too. Add all ingredients except for the seasoning to a food processor and blend until the mixture is smooth or to your liking. Add a little extra oil or some water if you like the hummus to be a little smoother. Taste and season accordingly before blending once more. You can also add fresh coriander or flat leaf parsley and perhaps a little cayenne pepper to give it a bit of a kick. This is a brilliant recipe for making your own bubbles that my lovely friend Jennifer gave me. She has used it several times and it works a treat. The picture is of a homemade wand made from canes and string so you can really make some sizeable ones to wow the children. Mix together gently trying not to create bubbles. Leave for an hour before using. A lovely morning spent in Ballycastle Forest with super friends was a really good start to the day today. Dog walking, climbing over trees, hunting for animals and birds and eating peanut butter sandwiches kept the little ones entertained on the long walk. It was so peaceful up there. We passed only two other small groups of people and the rest of the time the forest was ours. We’re so lucky to have so much green space on our doorstep. A trip to Megaw Park in Ballymoney yesterday was a great way to spend our morning. If you’ve not been before, the park is on Coleraine Road in Ballymoney. It has a great play park, outdoor gym, tennis courts, football pitch, obstacle course, zip line, picnic benches, a regular visit from an ice cream van and the all-important toilets. Everything you could need! It was a grey day yesterday so we decided to go to the cinema to see Incredibles 2. I’d highly recommend it as it was basically an animated action movie so lots to keep the whole family entertained. It’s classified a PG. I’m ashamed to say that it has taken me 9 years to make it to Rathlin. 😔 I’m not great on boats and so many people have told me stories of bad crossings that I’ve dragged my heels for a very long time. That all changed today though at 12 o’clock. I was definitely apprehensive about the crossing but the view from the boat and our excited children distracted me well. We hopped on the bus to the West lighthouse and RSPB reserve where we were lucky enough to see puffins, guillemots, razorbills and kittiwakes in their hundreds, possibly thousands. I was blown away by the sights, sounds and smells (!) and it has reignited the ornithologist in me. I shall be digging out my bird books and binoculars over the coming days. On our way back from the lighthouse we stopped off at the museum and also caught a glimpse of some seals basking on the beach. A really great mix of nature and local history that captured the imagination of the whole family. 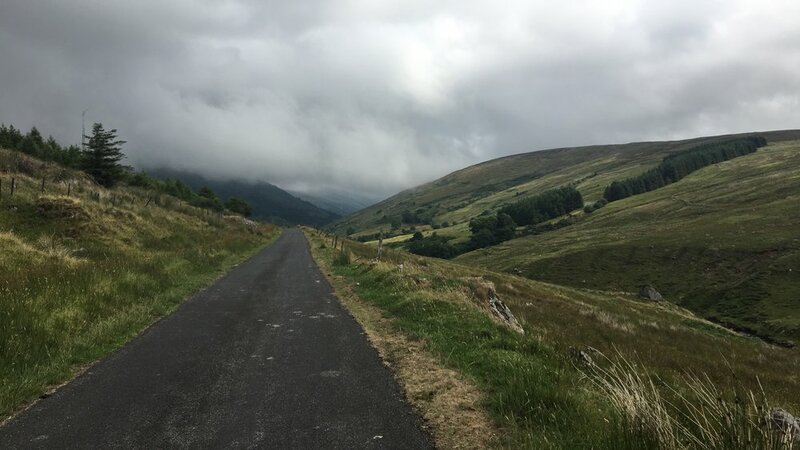 There are so many trails to walk, bikes to hire and beautiful scenery to discover so if you haven’t made it over yet or haven’t been in a while, make a few hours to do so. You’ll not regret it. This is a great, quick little recipe, full of flavour and easy to make when everyone’s hungry and needs their lunch like five minutes ago. Fry the onion and lardons together in a pan until browned. Beat the eggs with the butter then pour into the pan. Use a wooden spoon or spatula to mix the egg in with the lardons and onion, add the cheese and allow it to cook for a few minutes. Pop the omelette under the grill to finish cooking and browning on top. I served this with salsa and a salad but you don’t need me to tell you how best to eat an omelette! 😉 Any way is good. It was finally a rainy day! 😀👏🏻 Perfect conditions for having a bedroom clear-out and doing jigsaws. We’ve had so much warm weather that indoor tasks have been put on the back burner and wet weather activities on a plan b list. This afternoon we rode out the thunderstorm and heavy rain by having a jigsaw marathon after clearing-out William’s room (1 of the biannual bedroom clear-outs we all have). We’ve plenty for the charity shop and recycling so a successful day, albeit a quiet one. We took the Orra scenic route home from the Galgorm today and we really have to go there more often. I have only been once or twice before and each time I have been totally captivated by it. It is a stunning drive and there are so many places for walking and hiking that I now plan to explore. My photographs don’t fully capture the natural beauty of Orra but hopefully they’ll inspire you to (re)discover it yourself. With so few people or cars it is possible to truly disconnect with daily life and reconnect with the extraordinary beauty of our natural world. It’s been a hectic few months for us so it was wonderful to be able to get a night away together, just the two of us. John had bought me a voucher for the Galgorm resort and spa in Ballymena for my birthday earlier in the year and his parents kindly looked after the children so we could get away to enjoy it. The weather was glorious, which made for a beautiful afternoon in the thermal village. After much relaxation we had a delicious meal, a wander round the grounds and a nightcap in the River Room. Having some time completely on our own happens very rarely and we feel rested and replenished as a result. There’s going to be quite a bit of change ahead for our family so this couldn’t have come at a better time. We need to think about how we make more time for this sort of thing, for sure. Nights away at lovely locations don’t happen often but alone time and space to relax can be achieved much more simply and economically. It’s about making time for it. A walk together, a coffee or a trip to the cinema are all ways we could build it in to our routine. What could you do to ensure you get quality ‘us’ or ‘me’ time? We went to the beach three times today: once to Ballintoy this morning then twice to Ballycastle post-lunch and post-dinner. The weather has been fantastic and that always makes entertainment so much easier. Ballintoy was our destination for #wemeetwednesdays this week. The children collected as many different types of seaweed as they could, made some wild art with pebbles, watched a kayak class, made sandcastles, paddled and did a mini beach clean in the couple of hours we were there. It was lovely to have some time on the beach with few others around and also in the hours before it got super hot. Early starts are definitely worth it!